With your continued love and support, we are making a difference and saving lives! Here is just a glimpse of our rescue efforts in March! 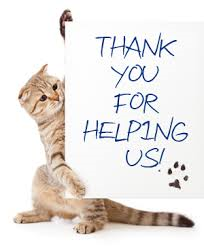 Thanks to the donation from Carole, one of our awesome supporters, a pregnant homeless cat is being spayed by Dr. East. After her spay, this kitty will return to a caretaker where she will be taken care of and we are also reaching out to other groups to help with food donations. There are at least two more females on the property that need to be spayed and we will be seeking donations for their spays. We would love to find homes for these kitties as they have been around humans but it's a matter of no room at Sparkle Cat Rescue or other groups that have been contacted. We've named this boy Finley. 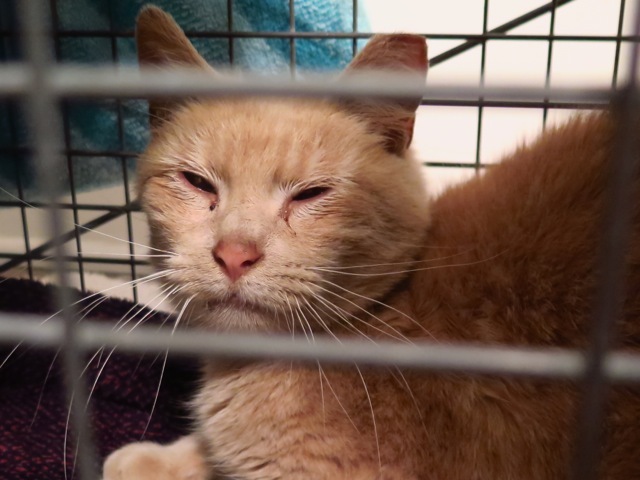 He was reported to us on Tuesday, March 24 after a woman found him in the parking lot at a local business and took him in a store and after he got scared and jumped out of her arms, he was trapped in the store for several days until we had a volunteer set two traps to catch him. He was successfully trapped overnight and taken into one of our foster homes for care and reported to local animal control on Sunday, 3/29. After the required 72-hour hold and no owner found, he has an interested adopter already through our network of rescue friends. He will go to a new home after Easter weekend. He is very sweet and very thankful to be safe. Sparkle Cat Rescue has another angel looking down on our rescue kitties. We are very sad to announce that Antoinette is at peace after we made the decision to have her humanely euthanized this afternoon at her visit to our vet. Given the description of Antoinette upon arrival to the vet, they wanted to do an x ray. She also registered a temp, and her labored breathing did not go unnoticed. The x ray showed fluid around her heart, indicative of FIP. We could have anesthetized ...her, drained some of the fluid to make her comfortable, send some off for testing, then put her on this and that, hoping it was something other than FIP. If she weren't FeLV+, we would have said YES, let's go the extra mile to ensure it isn't FIP, and see if she can recover. However…being FeLV+, we feared she would be put through invasive treatments only to arrive at the same inevitable outcome: she's suffering and won't get better. On a positive note, Antoinette was just beginning to fail and clearly suffer. 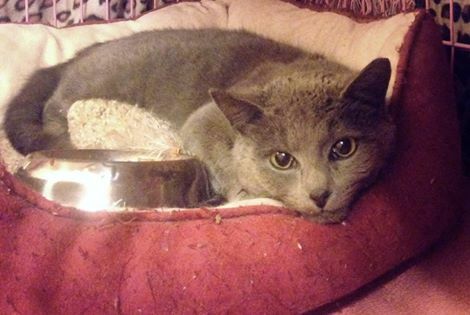 She was originally found alone in sub-freezing temperatures, starving, and very, very, sick. The vetting began with her rescuer, and continued as she was brought onboard by SCR. She recovered to enjoy an extended 4 months of life, in a cozy space, endless amounts of yummy food, and getting lots of love, as well as the ability to give love-she was quite the love-bug. It was evident today at MVH how she touched everyone’s heart.Thank you so much to Cheryl and Richard Knox and their family for all the love they gave Antoinette in their home. Despite her having to be quarantined in a room away from other cats, they went in to visit her frequently and lavished her with love. Thank you to our supporters for your love and prayers over the weekend. We so hoped and prayed that sweet Antoinette's diagnosis would not be FIP. Her memory will not soon be forgotten. She is a bright light shining down on all the Sparkle kitties, lighting the way for other homeless, neglected, and abandoned kitties to be rescued. After receiving a call early in the morning about two kitties that had been trapped days before and rescuer had an appointment with Dr. Linda East in Greensboro, I went over to assess them as I was concerned after being told tux had either an injured paw or a birth defect causing his paw to turn backwards. When I arrived at the rescuer's house, kitties were in the bathroom and in the bathtub under a litter pan cover and resting on a Sherpa rug. I lifted the cover and they immediately bolted. Gray one running to one end of the tub and tux not sure what to do. I got them to calm down but just sitting patiently and talking to them, sitting on the edge of the tub placing my hand out slowly while they sniffed my hand. We put a cat carrier in the tub because we knew they would want to get back under something to hide and sure enough that's what they did. It only took at the most 10 minutes to get them in the carrier. Boys were transported to Dr. East and tux's paw was assessed and determined to be an injury and his leg would need to be amputated. The plans early in the morning were for them to return to their rescuer's house for a few days while we waited to see if we get any adoptions over the weekend but I just could not let them go back with tux having an injury and both being so scared. The best place for them would be in our cat haven room where I could monitor them and soothe their fears, and they would also have much needed rest and peace and quiet. I scheduled an appointment for Tux at Plaza Vet for early evening because I was really concerned about his leg and didn't want to risk an infection beginning (if one hadn't already begun). He has no feeling at all in the leg from the top of the leg on down to the paws. The diagnosis is amputation. We will give him a week to rest and get acclimated to his new surroundings and will schedule his surgery. They are doing fine, still stressed out and time will soothe their fears and we've got all the patience required for them to come around when they are ready. Tux is named Tucker. Gray brother has not been named yet. Tucker had his surgery to amputate his right front leg on Friday, March 27 at Plaza Vet in Burlington NC. Surgery went well and he stayed for aftercare at the vet to receive his daily antibiotic injections. He was released on Wednesday April 1. He is very glad to be back in his foster home where we will work on continued socialization and helping him learn how to walk on three legs. I know he will come around and be a very sweet boy! He has had quite a bit of stress thrust upon him since his rescue. In danger of being trapped and taken to the shelter for no other reason than being born homeless. His life has been spared thanks to our friends at FCAP (Feral Cat Assistance Program) who contacted us asking for our help. He is safe now, content being pet and no hissing, biting, or scratching. Just a sweet, scared little boy. His siblings were trapped and rescued also and our friends at another rescue group have taken them in. PIXIE was actually rescued in February as a TNR but she is such a beautiful and sweet girl that her rescuer and our SCR volunteer kept her inside to be socialized. She is spayed, up to date on vaccines and will be combo tested. She was reported to our local animal control and was not claimed within the required hold period. She is doing great and is available for adoption through Sparkle Cat Rescue. ZEUS was rescued after being homeless for quite a while. His rescuer is one of our own fosters and Zeus had gotten into a fight with her cat so she took him to be combo tested and the results were negative. He was neutered at FCAP (Feral Cat Assistance Program) on March 1, 2015. He is doing great in his foster home and apparently very loving and thankful to be inside where he can get plenty of regular meals and lots of love! 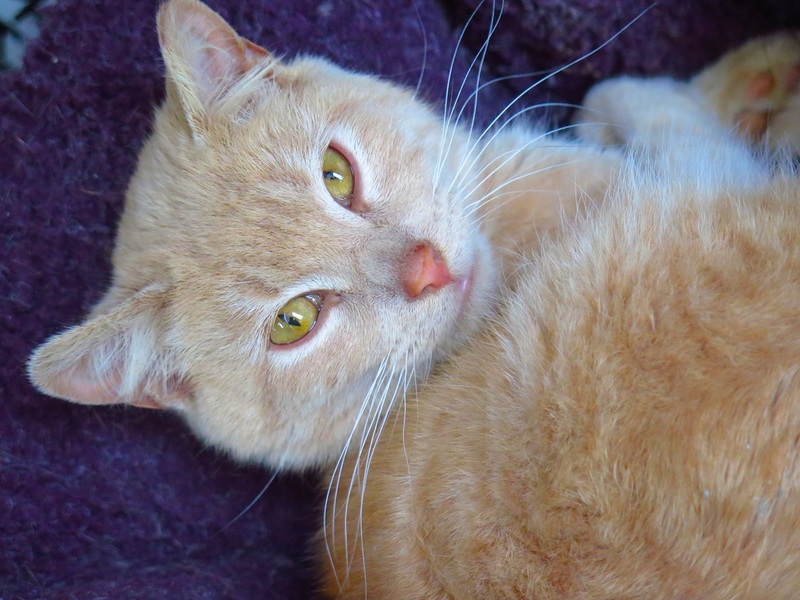 This sweet boy was rescued at a local business in Burlington NC by our amazing TNR (trap-neuter-return) & rescuer Cheryl. 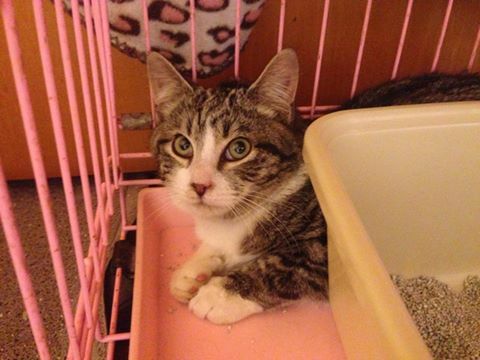 Her update on this lucky boy: "Kitty with injured leg! He is young, maybe 6 months, weighed in at a tad over 5 pounds. He was successfully neutered and vaccinated this past Sunday by Feral Cat Assistance Program. FCAP vet, Bill William Thomas Dawkins, confirmed his hip was dislocated at some point. The bones have fused so it will be left as is, unless it becomes an issue for him-then we will visit amputation. Kitty saw Dr. Brady yesterday for a combo test. The results were received today-NEG.!! Kitty is now resting comfortably in a kitty-condo, sleeping a lot, and enjoying the free-flowing food coming his way." This girl was found apparently abandoned at a local business (no houses or apartments nearby). She is doing well tonight in a dorm, resting and enjoying some good food. She is young, under a year old. We reported her to Animal Control in Burlington as found and after a 72-hour hold expired, she will now be available for adoption once she is ready. We do believe she is an abandoned girl, once homeless, forgotten, and now safe in Sparkle Cat Rescue cat haven. Update 3/15/2015 - this sweet girl loves to be pet and has come out of the cat condo on her own and is hanging out on 'the playground' (the cat tree). She gets along great with the other cats in the cat haven room.